An ultra sweet and rich dessert with a unique twist, I bet you've never had a pecan pie like this. Sweetened not only with brown sugar, but also with pure maple syrup, this pie is sure to be a hit at your next holiday table. The rich maple flavor really screams, but that's a good thing! It's also extremely easy to make: mix together brown sugar, maple syrup, eggs, vanilla, and melted butter...plus a little lemon juice and rum (yes, real rum). 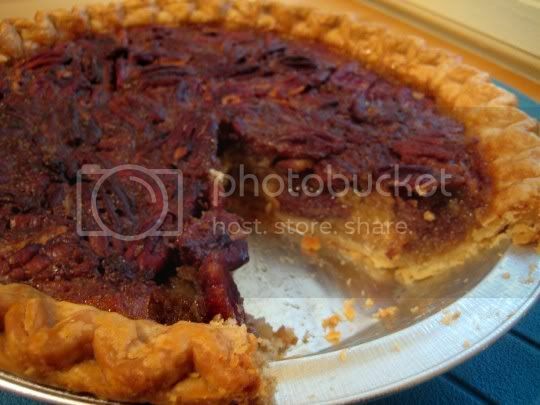 The rum can definitely be tasted, and is another flavor that will distinguish this from your typical pecan pie. Pour this into a pie shell, sprinkle the pecans on top, and bake. Even the pecans come out nice and carmelized and crunchy. A few recipe notes: the egg wash doesn't seem necessary, so save yourself one of the 4 eggs called for. The pecans aren't so much "arranged" on top of the pie; rather, sprinkle them evenly across...they will fall to the bottom and rise up, covered in maple syrupy goodness! Also, baking time seemed completely off. It took almost double the suggested 25-30 minutes for the pie to considerably firm up. As a result, I didn't even attempt to cut into it after it had cooled a couple hours. Overnight refrigeration worked well, though. Make again? Yes. This is best served within 1-2 days...any longer, and the pie starts getting that "wet" consistency.